My first book of compositions! 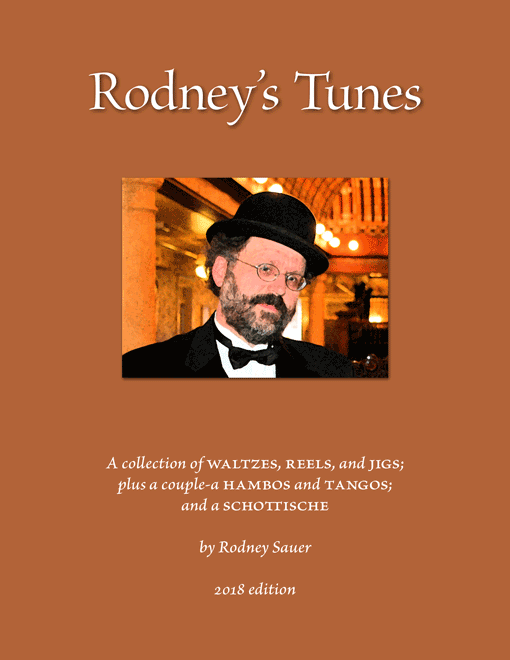 "Rodney's Tunes" contains over 30 "lead sheet" style melodies, ranging from elegant waltzes ("Bare Branches") to lively jigs ("Raspberry Vines") and reels ("Waiting for Dark"). Most are straightforward tunes, but a few are more unusual, including the calypso reel "Club Tico," the blues jig "Getting Along," and the experimental reel/jig hybrid "Alfred Prinzmetal." Purchase by following this link! The book is only $8, and will ship in a Priority Mail padded envelope for $7.25. US purchases only, please; if you want to order from out of the US please email me your address and I'll look up the shipping price. "I started writing dance tunes in college, and have been at it now for more than thirty years. These are the tunes that are the “keepers,” that I’ve found useful and fun to play. A few of them have caught on, and are played by other musicians. "My intent is not always to write tunes that are startlingly original. I just like good, solid, memorable dance tunes. Sometimes I borrow ideas that have worked in other tunes that I admire, and rework them in a way that is “original enough for me,” adding new ideas while keeping the valuable attributes from the tunes by which I was inspired. 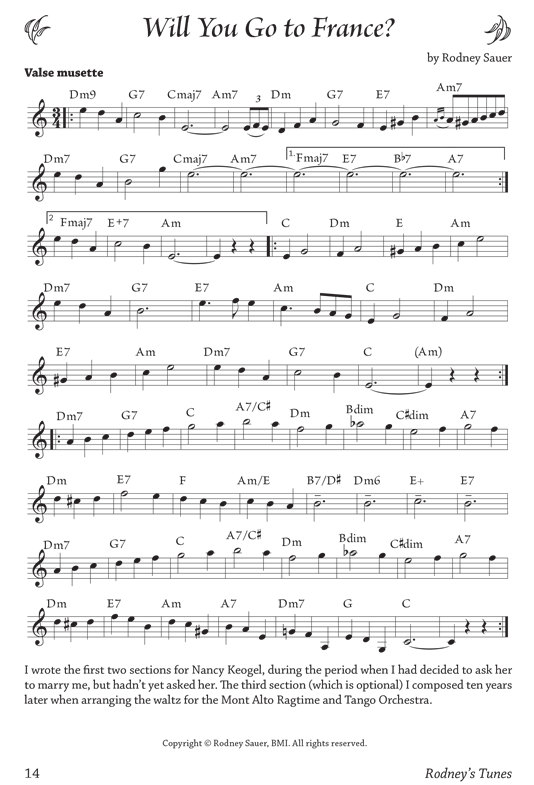 I’ve given credit in the tune notes to the inspirations, so that you can look those up too. I plan to release several of the waltzes in this collection on a an album of waltz music sometime in the next few years. Check my website to see if I’m finally done. "As is traditional in this kind of music, I have not indicated dynamics, articulations, slurs, or phrasing; except in a few places where I think it’s particularly helpful. That does not, of course, mean that you shouldn’t approach the pieces musically. Use that excellent musical taste for which you are so justly ­renowned. I give permission for any musician to play these tunes at live dances, sessions, and concerts. If you are going to record them or put recordings of them online, you need to license them through the proper channels. It’s only fair. Thanks!" Here is a sample tune: "Will You Go to France?" A romantic musette waltz. Also, a recording of the waltz (using a different pattern than on the lead sheet) that I made on piano and accordion for my son Rowan's wedding.